Today marks one week staying on track with my cooking & eating, and also one week without a drop of alcohol. This is really not nearly as bad as I envisioned it. I feel fine. Better than fine- I actually feel really good. Which means I’m all the more motivated to keep this going for another week. Friday is usually my “give up” day. The work week is over, I’m tired, and I’m not really thinking about a healthy dinner. I’m thinking pizza, wine, passing out on the couch by 9, because I’m in my thirties and I do that. Sue me. But today I stopped at Whole Foods on my way home and was pleasantly surprised to find out wild Alaskan salmon was on sale. One 6 ounce filet in the basket (my husband won’t eat it), and I felt awake and inspired. The only way I know how to cook salmon is grilling it, but it’s winter and I don’t want to wear a down cost while I make dinner. So I turned to my beloved NYT cooking app and found this jewel from Sam Sifton. Take a look. 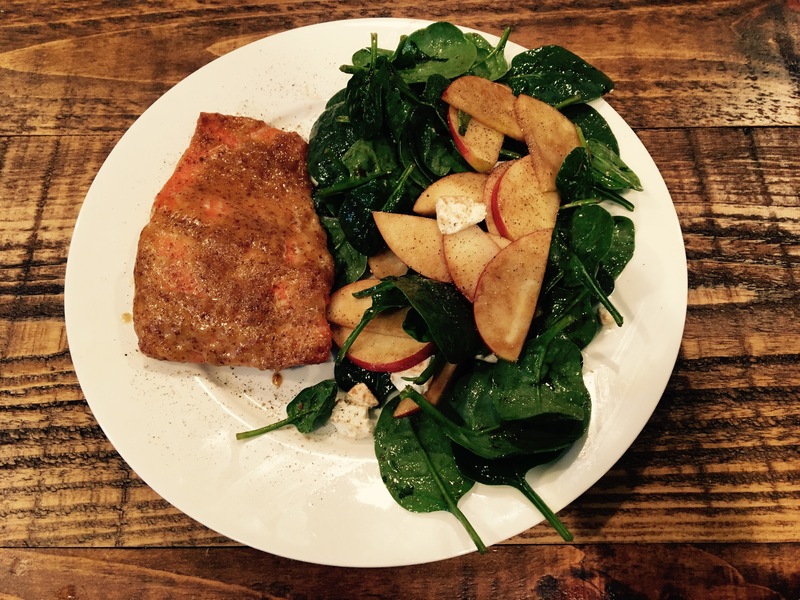 I think I cooked it two minutes too long, but the fish was super tasty, a perfectly blend of savory and sweet, and I paired it with a spinach-honey crisp salad, topped with goat cheese. This entry was posted in Recipes, Savory and tagged healthy cooking, nytcooking app, salmon, sam sifton. Bookmark the permalink.